Not many Blue Ridge Parkway getaways feature the same luxury amenities and stunning views like the cabins available through Blue Ridge Parkway Cabin Rentals! Surrounded by the lush foliage of the Pigsah National Forest, enjoy being immersed in the picturesque Blue Ridge Mountains without sacrificing all the comforts of home. 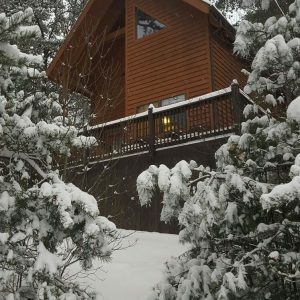 At Blue Ridge Parkway Cabin Rentals, we offer two immaculate cabins that perfectly mesh rustic charm with modern convenience. Located right off the famous Blue Ridge Parkway, warm knotty pine planks encompass the entire interior of the homes, perfectly complimenting the cabins’ rustic décor and furnishings. But the recessed lighting, cathedral ceilings and bright windows flood the spaces with bright light. Soak in the stunning views of the Appalachian Mountains while also soaking in a hot tub from the comfort of your own private front porch. On chilly evenings, cozy up to the fireplace and pop in a movie for a relaxing night in. But during the summer, spend your evenings around the fire pit and throw a few steaks on the outdoor grill. Or maybe you’d rather just keep cool in our air-conditioned cabins. Our cabin rentals make for ideal Blue Ridge Parkway getaways because we offer the rustic charm of a secluded cabin with all the amenities of home. Up to six people can stay in the two-bedroom, two-bathroom cabins, which come complete with linens and towels. Relax in one of two ceramic tubs with complimentary organic soaps made right here in North Carolina. Satellite TVs provide 190 channels of entertainment, and free Wi-Fi means you’re never out of reach. And the full kitchen is stocked with everything you need to create home cooked meals. Our cabin rentals are among the few that are located directly off the Blue Ridge Parkway. 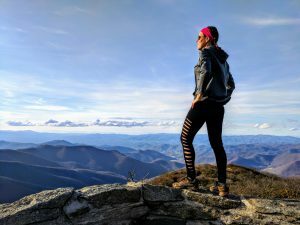 In addition to awe-inspiring views of the surrounding Blue Ridge Mountains, the parkway is an incredible resource for the active hiker or biker. Dozens of trailheads are located along the scenic highway. Spend your days exploring the beautiful High Country before returning to our luxurious rentals to relax. And our cabins are also pet-friendly, so be sure to bring along your favorite four-legged hiking companion! Book Your Blue Ridge Parkway Getaways With Us! When you’re ready to escape to the Blue Ridge Parkway, be sure to vacation with the best in the area. Book online to request a reservation today!